A Williamsburg trailblazer, est. in 2011 and voted by Brooklyn Magazine as one of the "Best Vintage Stores". We carry vintage, emerging designers and gifts for men and women, also hand-crafted apothecary, jewelry and accessories. Open M-Sa:12-7, Su:12-6. Brother and sister owned business that is determined to make men's and women's fashion affordable to everyone. With $5 racks to higher end designers, this is your store for trendy unique items at great prices! Spring hours 12pm-8pm. Summer hours 10am-9pm. A women's boutique offering unique, independent and affordable fashion. Featuring handmade sterling silver jewelry from local designers. Shop with us to find that piece you can't live without. Open M-Sa:10:30-7, Su:11-7. The British brands Williamsburg outpost offers men's, women's, and kids clothing, as well as footwear and accessories. Featuring select pieces from past collections and rare collectables at specially reduced prices. Open M-Sa:12-8, Su:12-6. 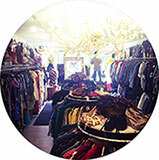 Hand-picked, curated vintage clothing and accessories from the 1940’s to the 1990’s. New inventory daily for men women and children! We offer a buy, sell, trade model - so bring us your vintage!Open everyday 11-7. Fresh, contemporary fashion for men featuring brands like Naked and famous, Life after denim, Scotch and Soda, Neuw, WeSc, Moods of Norway, Penguin, Jshoes, Descendant of Thieves, Persol and Ray Ban. It is the only complete men's store in Williamsburg. Open 7 days from 11-8. With two locations, ID is a carefully curated men's clothing store offering a smart mix of timeless classics and modern essentials. We take pride in sourcing garments and accessories that contribute to making our customers feel unique and special. Open 7 days from 11-8. Don't miss our fun & fab French vintage boutique! New York babes' favorite wardrobe: iconic brands, accessories, lingerie, furs, antique home decor & curiosities. Victorian thru 1990's. Rental ok. Open everyday 12-8. Pema (peh-ma) is one of the oldest stores serving the Williamsburg community. From that perfect dress, jewelry to shoes, it is the neighborhood's popular choice. Also features bags, shoes, scarves, hats and more at very affordable prices. It is a must see place for everyone. Open daily 11-8. Stocking the finest in men’s and women’s vintage wear featuring a line of mainly locally made clothing and accessories that takes its inspiration from vintage but possesses an of-the-moment sensibility. Also offering carefully curated vintage pieces that are an essential element of the store.Summer hours M-Su:12-7. Little vintage shop on Havemeyer Street. All hand-picked from US, Japan, & Europe. Classy, glamorous, well- made designer pieces to eccentric, gorgeous one-of-a-kind dresses. You will find the most amazing vintage from all over the world at this little shop. Open Tu-Sa:12-8, Su:12-7. Closed Monday. A store vital in the Williamsburg area sells exceptional women’s clothing and gifts. We carry beautiful handcrafted jewelry and accessories. Open M-Th:11-8:30, F-Sa:10:30-9, Su:10:30-8.